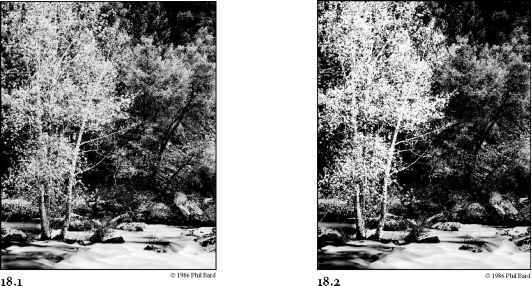 Phil Bard shot the photo shown in Figure 18.1 in 1986 in Yosemite Valley, California. This image is the result of several contrast manipulations of the original scan, and is basically "finished" except for the fact that, to Phil, the foreground tree details lack sufficient brightness. He wanted it to stand out a little more from the darker background. Selecting the general area of the tree and performing a Levels or Curves adjustment would be one way to achieve this, but that would also lighten mid-tone areas of the background somewhat as well. Instead, he chose a more surgical approach, one that affects only the tree. In this technique, you discover how Phil was able to extract the tree based on its value. 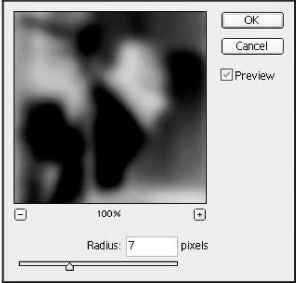 In other words, a specific range of tones is selected based on their location in the histogram. The Photoshop 7 masking and adjustment layer features have many applications, one of the less obvious being the ability to extract image information with respect to value. This is a useful technique for mimicking a darkroom technique called bleaching, in which highlights are lightened without significant effect to the mid-tones and shadows. ■ Choose File ^ Open (Ctrl+O) to display the Open dialog box. 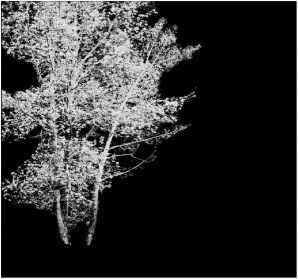 Double-click the /18 folder to open it and then click the cottonwood-before.tif file to select it. Click Open to open the file. ■ If the Channels palette is not visible, choose Window ^ Channels. In the Channels palette, click the Load Channel as Selection button (the left-most button), located at the bottom of the Channels palette. This creates a graduated selection of the entire image based on value, with the lightest details being most selected (least masked) and the darkest, least selected (most masked). If you want to use this technique on RGB or CMYK images, you will need to select the channel or channels you want to load as the selection. 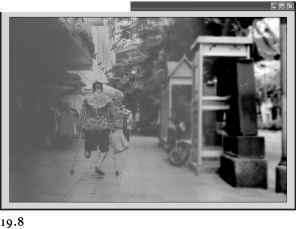 In the case of the image used in this technique, the image is a grayscale image and there is only a single channel to load. ■ Click the Quick Mask Mode button (Q) in the Tools palette, which will create a mask from the selection. Your image should now look like the one shown in Figure 18.3. ■ Hide the Gray channel by clicking the eye icon (to switch it off) in the Gray layer in the Channels palette so that you can better view the mask. Notice that the mask is now thinest (lightest) over the highlight areas. Remember that you are looking at a black and white mask, not the black and white image. Actual Pixels (Ctrl+Alt+0).Choose View ^ Fit on Screen (Ctrl+0) to fit the image on the screen. ■ Because we want to further reduce the selection so that we can make changes only to the Cottonwood tree,edit the mask further.Click the Quick Mask channel in the Channels palette to select it if it is not already highlighted. ■ Choose Image ^ Adjustments ^ Curves (Ctrl+M) to get the Curves dialog box. ■ In the Curves dialog box, drag the curve into the shape illustrated in Figure 18.4. 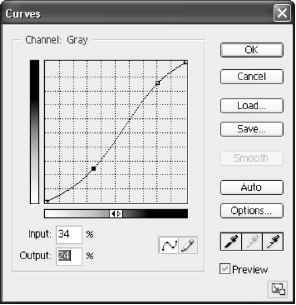 To make the Curves dialog box show a 10 by 10 grid instead ofa 4 by 4 grid, press Alt while clicking inside the curve box. Set the lower end-point so that the Input and Output values are 50% and 0% respectively. Set the upper end-point so that the Input and Output values are 75% and 100% respectively. Click OK to apply the settings. This Curves adjustment increases the density of the mask in the highlight areas, while eliminating the shadow and some of the mid-tones, which helps to isolate the tree itself. This is a crucial adjustment that must be done to make this technique work. ■ Click the Lasso tool to draw a selection around the Cottonwood tree on the left of the image as carefully as you can, excluding the water and rocks where possible. Absolute precision is not necessary, but make sure you include all of the tree branches. Make sure that the background color is set to black. This is very important! Press the Delete key. This eliminates the non-tree areas from the mask. Your image should now look similar to the one shown in Figure 18.5. ■ Choose Select ^ Deselect (Ctrl+D) to remove the selection marquee. ■ Click the Eraser tool (E) in the tool palette. In the Options bar, set Mode to Brush, Opacity to 100%, and Flow to 100%. Using the Eraser tool, erase any of the detail you want, while leaving only the tree. This means that you should be erasing areas where there are large amounts of black. Be careful not to use too large a brush and erase important detail. To do this, you may want to vary the size of the Eraser tool from 35 pixels to 100 pixels by clicking the Brush Preset Picker on the Options bar. ■ Now we are ready to apply the mask. In the Channels palette, click the Gray layer and then click the Standard Mode in the Tools palette. Notice that a marquee appears indicating that the mask has now become a selection. ■ Choose Layer ^ New Adjustment Layer >-Curves to get the New Layer dialog box. Click OK to get the Curves dialog box. Click the curve in the Curves dialog box to set a point at 34 and 24. Click the curve again to set a second point at 80 and 85. The Curves dialog box should now look like the one shown in Figure 18.6. Click OK to apply the settings. 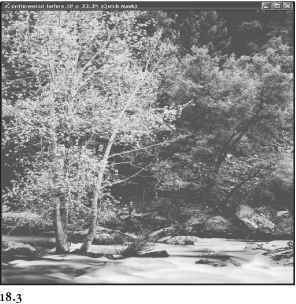 This curve increases the contrast of the layer, which makes the Cottonwood tree stand out from the other trees, as shown in Figure 18.2. If you uncheck and recheck the eye icon in the Curves 1 layer in the Layers palette, you can view the results of this new adjustment layer. Of importance is the fact that any changes made to this curve apply only to the tree, which has been extracted, so to speak. Remember that, because this is an adjustment layer, you can always go back and edit its effect. And because the mask you just made resides in this layer, you are able to load it as a selection and add more adjustment layers if you want. This useful technique is applicable in many ways beyond what we have explored here. By inverting the color of the mask (during editing in Quick Mask mode), it can be used to select shadow areas and therefore increase or decrease their local contrast. Another approach you may want to try to get a similar effect is to duplicate the background to a new layer, then set the blend mode of the new layer to a lightening mode and use the Blend If sliders. This would create the same results; however, it would not be limited to just a masked area. To learn more about Phil Bard and his work read his profile at the end of Technique 16. When I first looked at Jimmy Williams's portfolio, I was struck by how he was able to transform rather ordinary subjects into absolutely captivating images. Even more surprising to me was how these images were then turned into high-profile ads or commercial images for his many prestigious clients. Part of his early success was due to his creation and mastery of in-camera techniques. With the onset of digital imaging and Photoshop, Jimmy has now become proficient in mimicking those techniques digitally. 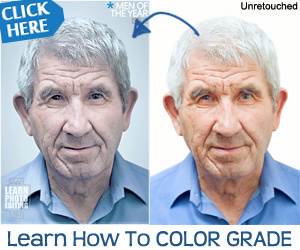 He can now choose between in-camera techniques or just shoot the shots and accomplish the same thing digitally with Photoshop. In this technique we'll look at how he used Photoshop to create a selective blur that a few years ago, could only have been done with a camera using swings and tilts. As you will see in this technique, Photoshop allows much more control over the selective focus technique allowing him to have greater accuracy for placement and quantity of blur, and he can even be more selective about which parts go out of focus, even to the extent of not following the rules of optics should he decide to do so. This digital approach allows him to make such decisions after shooting when he can think with less distraction and evaluate the small nuisances as well as his emotional reaction to the effect. ■ Choose File ^ Open (Ctrl+O) to display the Open dialog box. Double-click the \19 folder to open it and then click the boy-before.jpg file to select it. Click Open to open the file. ■ Choose Image ^ Mode and you notice that this image is CMYK color as this is the mode that Jimmy uses because almost all of his work is printed on a press. Click in the image to close the menu. ■ Choose Layer ^ Duplicate Layer to get the Duplicate Layer dialog box shown in Figure 19.3. Type blur layer in the As box and click OK. Figure 19.4. Using the slider, set the Radius to 7.0 pixels. Click OK to blur the image. For more than two decades, Raleigh, North Carolina-based Jimmy Williams has captured unforgettable images, winning him a coveted spot on Adweek's Southeast Creative All-Star team. He has been recognized in nearly every creative show and publication in the advertising the boy. Alternatively, click the Add Layer Mask button at the bottom of the Layers palette. The Layers palette should now look like the one shown in Figure 19.5. ■ Click the Brush tool (B) in the Tools palette. ■ Click the Brush Preset Picker in the Options bar and select the Soft Round 300 Pixels brush. If you cannot find the brush, click the menu button in the upper-right corner of the Brush Preset Picker and select Reset Brushes; then click OK.
■ Make sure that the Options bar shows Mode as Normal. Set Opacity to 100% and Flow to 20%. palette. Then click the Switch Foreground and Background Colors (X) button in the Tools palette to set black as the foreground color. Painting on the layer mask with black masks out the blurred layer thereby allowing the sharp layer from below to show through. The objective is to slowly build up a smooth gradation so that the boy on crutches is in focus while the rest of the image is blurred. ■ Using the Brush tool, paint vertical strokes where the boy is standing. Because Flow is set to 20%, you have to click and paint several strokes to make a pure black mask so that the boy is totally in focus. Then, paint a few strokes on either side to make a smooth graduation between the blurred and focused parts of the image. Be aware that no matter what Flow setting you use, you can never get more opaque than your Opacity setting. Flow controls how quickly the paint builds up to the Opacity value. Hence, if you want to paint 100% opaque black, Opacity must be set to 100%. ■ If you paint too much in an area, you can set the foreground color to White (X) and erase the mask. Should you be unhappy with your masking altogether, you can choose Select All (Ctrl+A) and then Edit ^ Cut (Ctrl+X) and start again. industry, including Communications Arts, The One Show, The Art Director's Club, Print, Graphis, and the Addy's where he has won Best of Show honors. While still shooting with film, he has developed a digital workflow that allows him to provide exceptional digital images or prints to his clients to meet their specific requirements. Jimmy may be reached by telephone at (919) 832-5971. 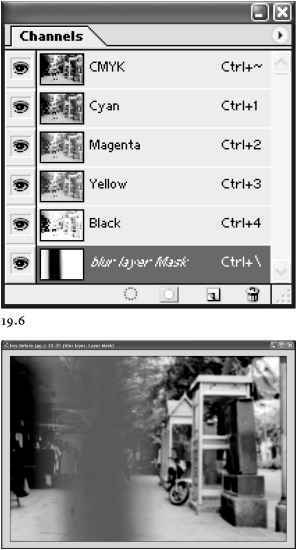 ■ To view the mask, click in the Make Visible column to turn on the eye icon on the blur layer Mask channel in the Channels palette, which should look like the one shown in Figure 19.6. The mask should look similar to the one shown in Figure 19.7. Click the eye icon in the blur layer Mask channel in the Channels palette once again, to turn off the mask.You can now continue painting on the mask if needed. ■ Choose Layer ^ New AdjustmentLayer ^ Curves to get the New Layer dialog box. Type darken right side in the Name box; click OK to get the Curves dialog box. Click in the center of the line in the Curves palette and drag it until Input and Output show 45% and 54% respectively. 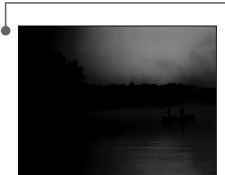 Click OK to darken the image. 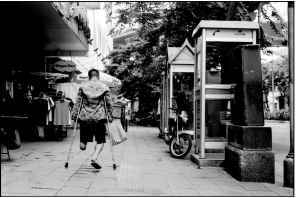 ■ Once again use the Soft Round 300 Pixels brush and paint vertical strokes starting at the left edge of the image to lighten the left side.Vary Flowfrom 100% to 20% to make a slight gradation between the boy on crutches and the buildings just to his right. 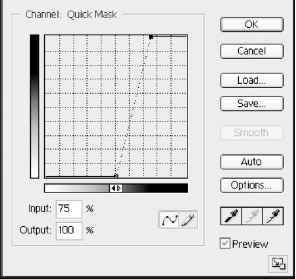 Your mask should look similar to the one shown in Figure 19.8. If you have turned on the mask, turn it off before continuing to the next step. ■ Click the darken right side layer in the Layers palette to make it the active layer. ■ Choose Layer ^ New AdjustmentLayer ^ Hue/Saturation to get the New Layer dialog box. Type hue/saturation in the Name box; click OK to get the Hue/Saturation dialog box shown in Figure 19.9. First click in the box next to Colorize, and then set Hue to 15, Saturation to 25, and Lightness to 1. Click OK to apply the settings. ■ Choose Layer ^ New Adjustment Layer >-Curves to get the New Layer dialog box. Type overall color in the Name box; click OK to get the Curves dialog box. ■ You now set three points and adjust each end-point, as shown in Figure 19.10. Drag the upper end-point toward the left; Type 95 and 100 in the Input and Output boxes. and 0 in the Input and Output boxes. Click the curve to set a point. Type 20 and 24 in the Input and Output boxes. Click the curve to set a point. Type 39 and 57 in the Input and Output boxes. The Layers palette should now look like the one shown in Figure 19.11. 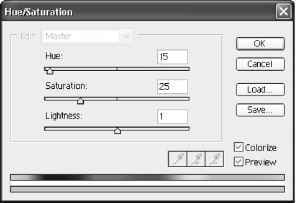 Because of the extensive use of adjustment layers, you can go back at any time and fine-tune the settings and masks until the image is exactly as you want it.